“We lived by the bell. Bell rang at eight o’clock when the men would go to work, rang for after recess time, rang for dinner, rang for morning and afternoon tea and after school” (Irene Agius). 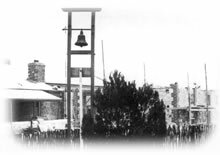 “That’s the old bell. You could hear it from right down the beach, we used to hear it tolling” (Phoebe Wanganeen). Work orders would be issued in the morning and shirt making, farming and building were some of the activities undertaken. 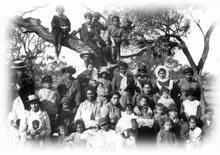 If there was no work available on the station people had to seek employment elsewhere and many of the young women were made to work as domestic servants outside the mission, travelling as far a field as Adelaide. The men worked throughout the peninsula, as shearers, wheat haulers and bag sewers. The children had plenty to do besides school and church. Picnics were held in Wadgedin Scrub, sports days at the beach, there was dancing, socials, Sunday school and debutante balls. Pictures were shown on the old meat shop wall and later in the hall. There was shearing to watch and the old wool shed was known as ‘lover’s lane’. People collected various food from the property; wild ducks, swans, fish, shell fish, bird eggs, and plant foods. Rabbits were also a source of food and money with a bounty of a ‘penny a scalp’ paid. Some people chose not to live within the confines of the mission and instead lived in ‘bagcamps’ or wurlies on the outskirts of the settlement. People visiting Point Pearce would stop over at these camps before being welcomed onto the mission. Some of the buildings were quite substantial with cement flooring and permanent chimneys. People were quite able to speak their own language, and enjoyed the freedom of living away from the regulations of mission life. Despite an attempt to remove them in the 1920’s, people continued to live in the camps until around the 1950’s.